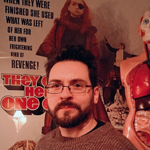 Josh Saco is one of the UK’s leading independent film curators and runs Cigarette Burns Cinema. Catering to fans of leftfield, classic horror and exploitation cinema, he celebrates the celluloid, screening primarily from rare 16mm and 35mm prints at prestigious venues including the Barbican, Prince Charles and Regent Street Cinema and various festivals. Saco offers a unique and informed perspective on everything from beloved genre oddities to the complexities of film, digital and modern cinema.